A number of our members have recognized that an investment in PILP can be an excellent way to save personally while benefitting Faith Presbyterian Church. 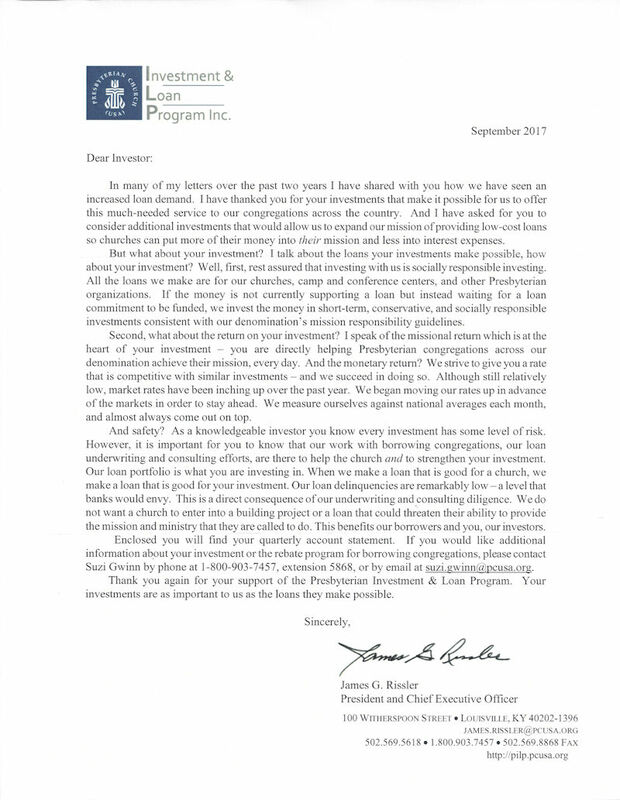 James Rissler, the President and CEO, recently sent the letter below covering PILP as an investment. PILP has also announced a special Great Rate Program offering a 1.80 APY on 3-year term notes. To see the brochure, click here. We currently are earning a 0.50 percent rebate on our mortgage through your investments and have the opportunity to increase the rebate to as much as 1 percent through additional investments. If you are interested in additional information you can contact PILP at 1-800-903-7457 ext. 5865, via E-mail, investment.help@pcusa.org, or click here.